Countries worldwide as well as international organizations have voiced condemnation and concern following an early morning terror blast in Istanbul's Beyazıt district Tuesday which killed 11 people, including seven police officers. 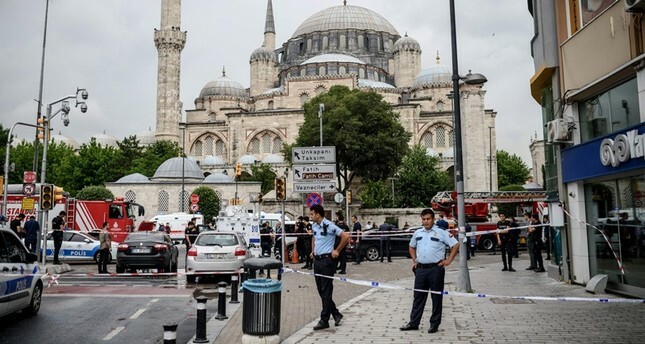 The terror attack, detonating a bomb-laden car on a riot police vehicle in Beyazıt's Vezneciler neighborhood on the city's European side, was carried out at 8.40 a.m. local time (0540GMT), said Istanbul Governor Vasip Şahin. NATO Secretary-General Jens Stoltenberg said in a statement that NATO stands in solidarity with Turkey and added: "I firmly condemn this morning's terrorist attack targeting a police vehicle in Istanbul, which killed a number of people, including police officers, and injured many others." Stoltenberg also decried how Turkey was once again struck by the "scourge" of terrorism. "Terrorism seeks to undermine the very values that the North Atlantic Alliance stands for: democracy, individual liberty, human rights, and the rule of law. It can never be tolerated or justified," he added. The EU also released a statement saying: "We extend our sincere condolences to the families and friends of all those killed today and wish a speedy recovery to the injured. The European Union would like to reiterate our continuing solidarity with Turkey, its government and its people and reaffirm our commitment to work closely together to fight the global threat of terrorism." Council of Europe leader Thorbjorn Jagland said in a statement: "Again, a deadly attack in Istanbul has killed and injured so many innocent people in the nation's largest city. I am devastated by the news and cannot but repeat that these ruthless attacks are attacks on our values - on us all. I express my deepest sympathy and condolences to the families, the people and state of Turkey." The Parliamentary Assembly of the Council of Europe (PACE) also condemned the "blind fanaticism" of terrorists. Azerbaijan's President Ilham Aliyev sent a letter of condolence to his Turkish counterpart Recep Tayyip Erdoğan, saying: "This brutal terror attack once again confirms the importance of the struggle against all sorts of terrorism." French President Francois Hollande also condemned the attack, saying: "This intolerable act of violence must more than ever confirm our mutual determination to fight all forms of terrorism." Spain's Foreign Ministry "strongly" condemned the terror attack in a written statement and conveyed its condolences to Turkey. In a message posted on his Twitter account, British Foreign Secretary Philip Hammond said: "Thoughts with the victims of today's #Istanbul bomb attack. The UK utterly condemns this senseless & appalling act of violence." US Ambassador to Turkey John Bass said on his Twitter account: "Deeply saddened by the barbarous terror attack in Istanbul. Such senseless violence could never be rationalized by any cause." Bass extended his condolences and added: "We condemn this heinous attack, and continue to stand shoulder-to-shoulder with Turkey in the fight against terrorism." In a statement, Pakistan's Foreign Ministry said, "Pakistan condemns this terrorist act in the strongest terms and reiterates its condemnation of terrorism in all forms and manifestations. As always, Pakistan stands in strong solidarity with the fraternal people of Turkey and is sure in its belief that they will succeed in their resolute fight against terrorism and will defeat this scourge decisively." The statement also expressed "heartfelt sympathies and condolences to the bereaved families" and hopes for "the speediest recovery for the injured."